Halloween is around the corner. 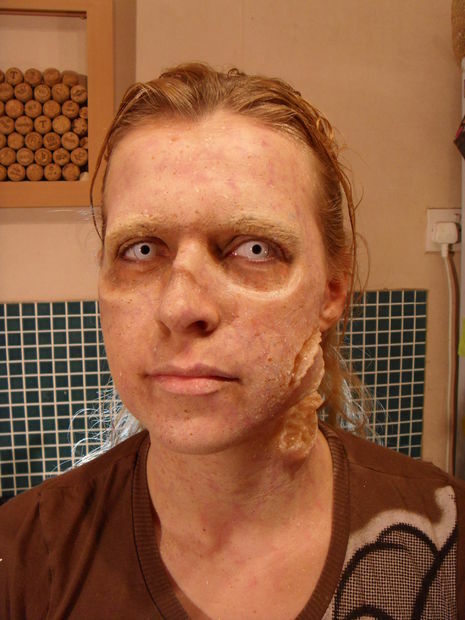 Surely many of you want to find a makeup that can make you look like a living dead or a zombie. This kind of costume is quite frequent during this celebration, and can also be practical for the next carnival. 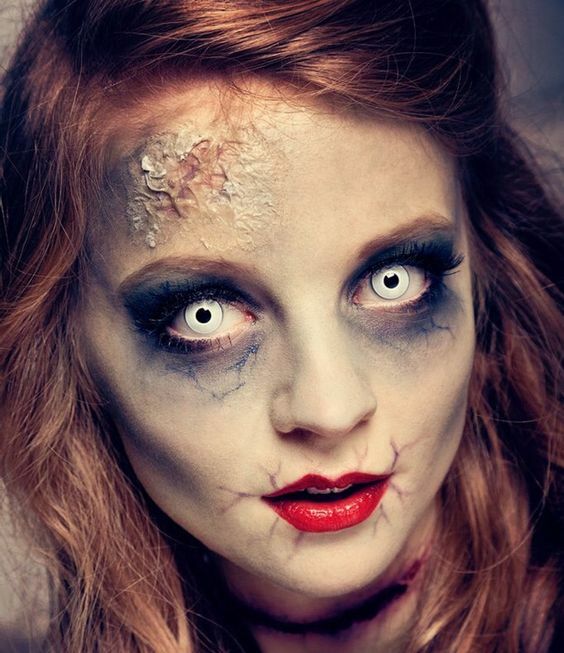 Therefore, we will be taking about halloween zombie makeup: how to look like the living dead. 1.1 What do you need for a good zombie makeover? If you want people to be very scared next Halloween, there is nothing like choosing to go as a zombie from The Walking Dead. Although this type of costume is easy, doing the makeup will be a little more elaborated. Nevertheless, it won’t be too complicated. 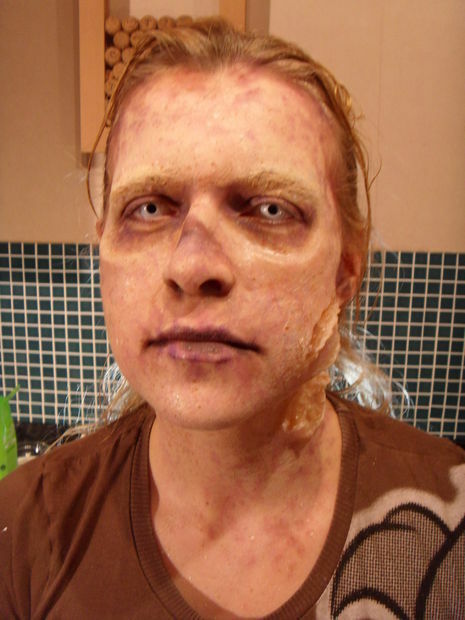 It’s quite possible that many among you have tried to do your own living dead makeup for a carnival. For those of you that have a little bit of experience, you surely know that, for instance, it is basic to get a makeup that allows us to look emaciated, with dark circles and, why not, with blood all over your face. The makeup foundation by itself it’s easy to put on. The details that can be more demanding are the type of blood, wounds, bites and of course, the eyes. 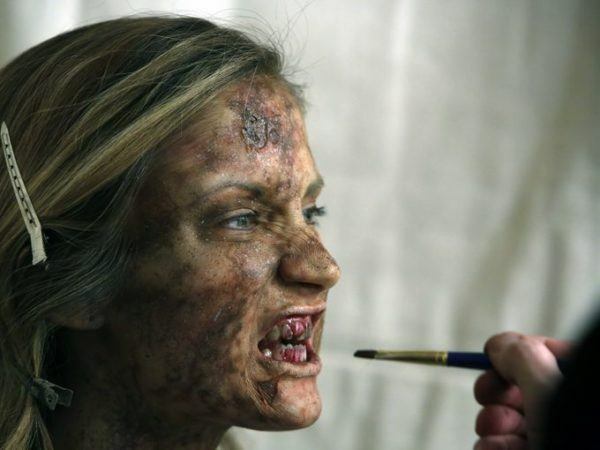 What do you need for a good zombie makeover? 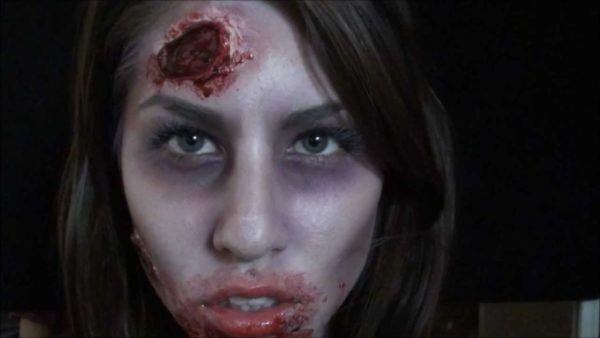 Let’s see now how to do your Halloween zombie makeup but in a somewhat more professional way than usual. Do not be scared that it is too complicated to achieve. It’s easy if you follow all these steps. Before you start to do your zombie makeup, circling your eyes with dark shadow and faking wounds, we’d like to show you what you need for your hair and eyes. It is best to choose contact lenses that make you look like your iris and your eye is really the one of someone dead. 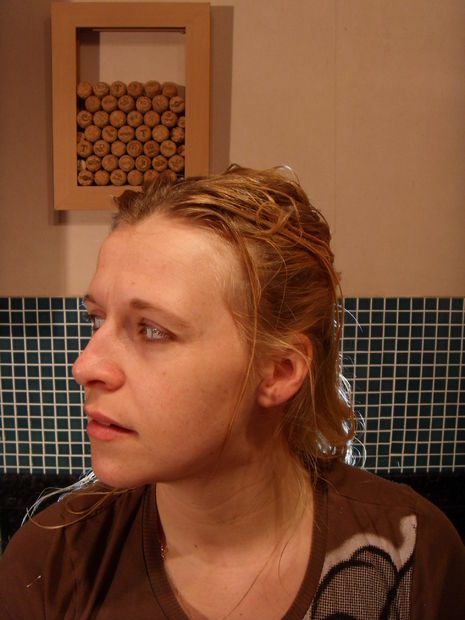 As for the hair, it needs to be greasy to make it look like you were actually dead for a long time. In order to achieve that you can apply enough conditioner. Let’s start with the wounds. To create the wounds, we must apply gelatin under the eyes, and at the same time latex with a little gelatin on it as well. In doing so, we will look like the photo above, as if someone had bitten us before we became a zombie. Let the gelatine dry so that when you finish doing your makeup your eyes look more sunken. While the gelatine gets dry, you can paint the latex with some instrument or palette, so that it looks like someone bit you there. Once the material has been applied to create the wounds, we have to proceed with the makeup. We can start with a creamy white base, which we should apply all over the face. We then apply brown eye shadow in the eye sockets in order to give a haggard effect and create dark circles with it. And to get the mottled appearance of the color lilac, you must use a thin brush with a small amount of lilac makeup to make wavy lines across the face. When it comes to make up, you better cover your eyebrows, so that they are not stained and with that you can also ensure that there is a more natural makeup. Grab a knife that doesn’t cut, which will simply allow you to “break” the makeup. What we want is to resemble a “cracked” makeup and with such a knife, that has a little tip, we can make small cuts to achieve the desired look. 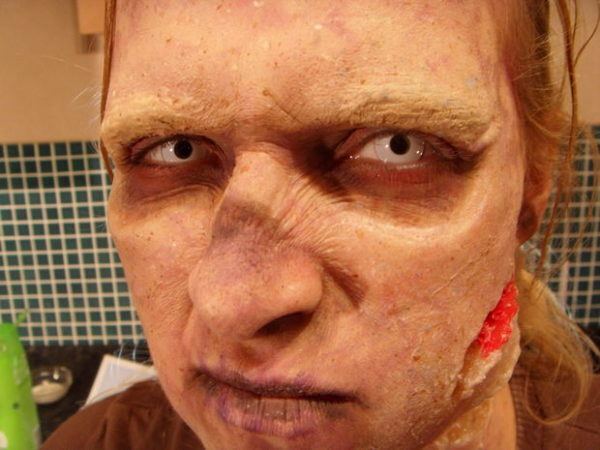 We are still giving the last touch to our Halloween zombie makeup as we must focus on some details. In order to do so, you should draw lines in brown and lilac around the hairline, eyes, nose and lips. Try not to do many, but do not do two or three. Start by making thin lines, combined with small spots, to create a bruised appearance. 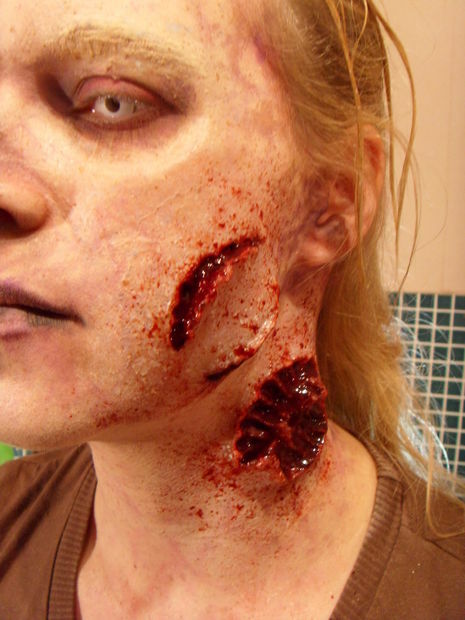 Of course, there are other details that we can introduce in our living dead makeup, such as adding some red paint inside the wound that we have created to make it look like an even scarier bite. I have already told you to paint the wounds with some red paint, but you can also make your appearance more believable if you dedicate a few minutes to another details. In order to do so, it is better to buy some fake blood and fully cover the inside of the wound. Nontheless, you can also take a brush and throw in it some blood so that looks like the biting did that. 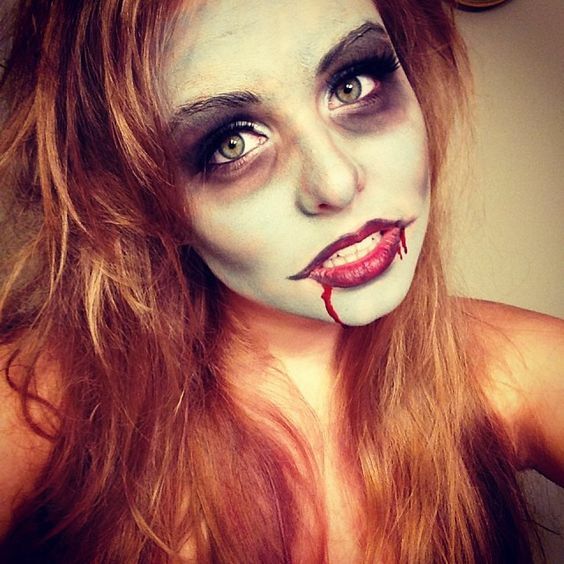 With what we had been explaining up until now, we may already have the perfect zombie makeup for this Halloween, right? Well, not yet. If you want everything to be on point all night long, it is better to spray your face with a little bit of hairspray. This will maintain the makeup. You can also add a little bit more of blood here and there and a little bit of vaseline on the raised parts of the face and on the lips. This will help highlight those areas. Now you are ready to be the scariest zombie out there this Halloween. 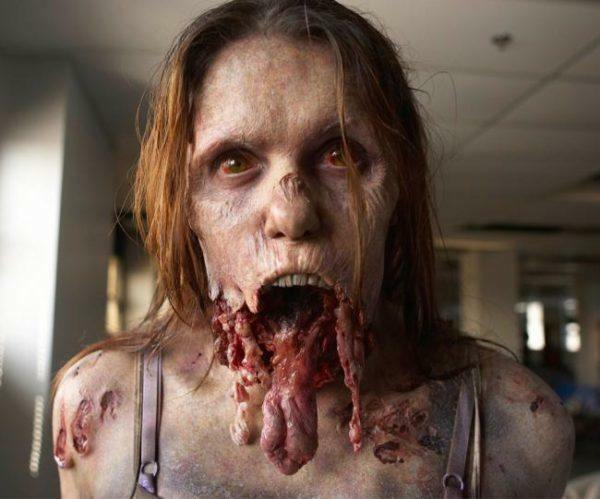 One final tip: if you want your mouth to look like an even more realistic living dead, mix some dark brown food coloring and apply it around the mouth for a minute or two. 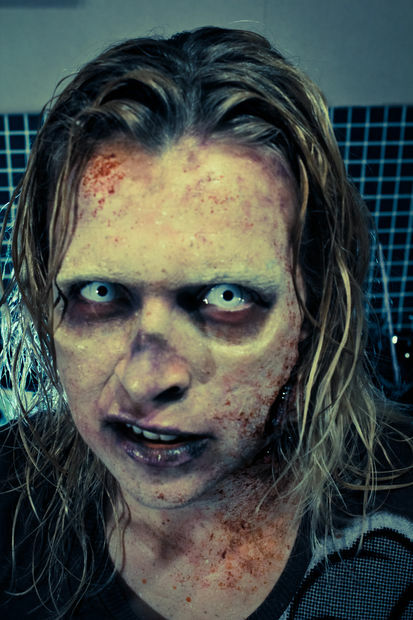 Of course, when the fun ends and you have to stop being a zombie you should wash your face with soap and water. Also, use a wipe, it will help you erase all the makeup that the soap or water can’t. Do not forget to apply some facial tonic once you’ve erased the makeup and, first and foremost, apply a little moisturizer. 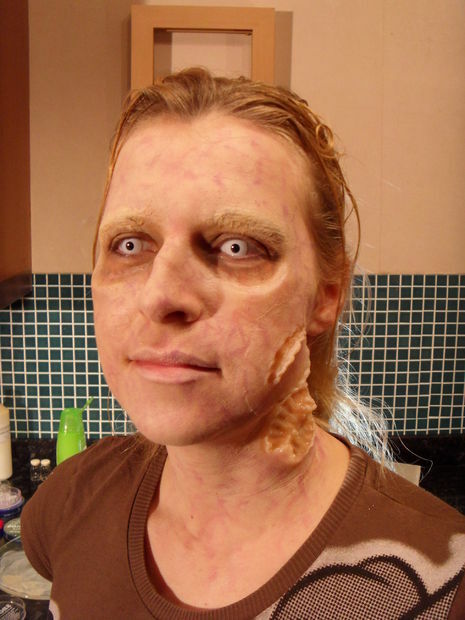 We have already seen a complete step by step Halloween zombie makeup: how to look like the living dead, but we have other options. This is why we want to show you these other options below. 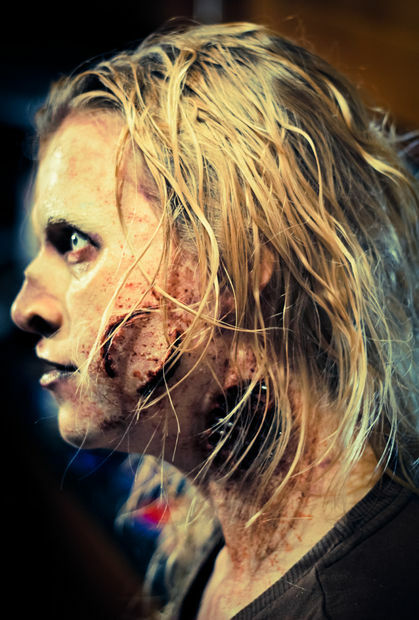 That way you will see a wide range of possibilities to choose from and to add to your zombie makeup for Halloween. The tutorial that we have shown you might have seemed quite elaborate. If you want something easier, you can do your makeup as you can see in the picture above and you can also use this example as an inspiration for a vampire costume. A bit of white foundation, a little bit of eye shadow (in order to create the dark circles) and some red lipstick. 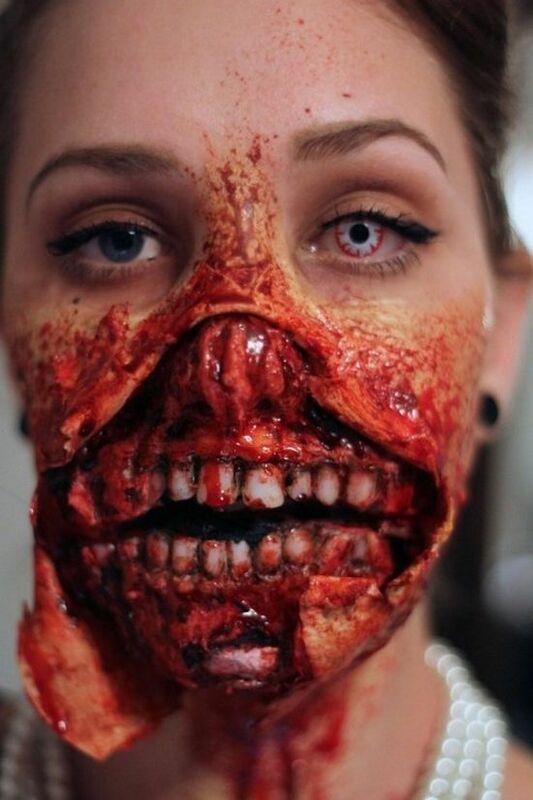 Add some artificial blood to the corners of the lips so that we can make believe that we have just bitten someone. You can also try to mark a few veins so that you go from a simple halloween zombie makeup to a somewhat more elaborate one. You can do this using a lilac eye pencil: you can draw the veins like the ones you see in the picture above. With a good tip in your pencil, draw lightly dividing lines into smaller others. In doing so, you will make them look like real veins under your skin. If you have applied too much lilac, you can always slightly cover it with the foundation. 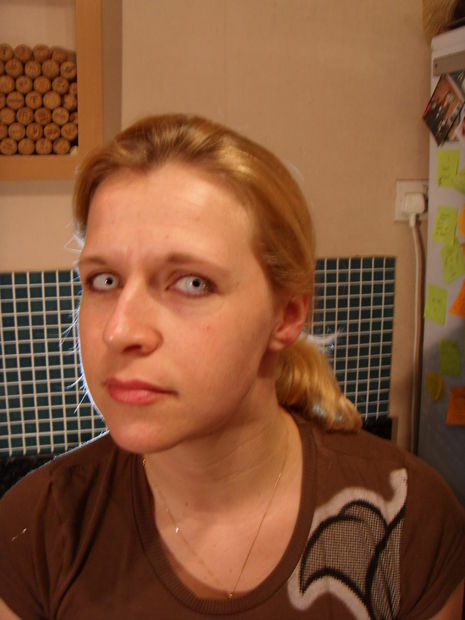 The contact lenses are a great choice for a good zombie costume on Halloween. This way you can choose the color of the lenses (white or black) and scare people to death. Add some latex to imitate real wounds and you’ll be more scarier than ever. 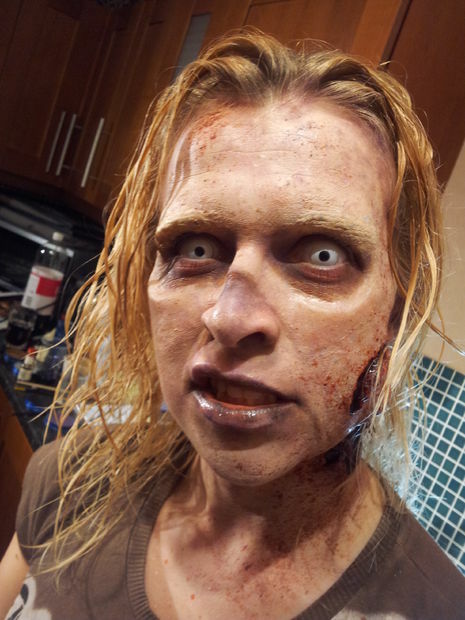 For the true fans of The Walking Dead, there is nothing like looking at their makeup and trying to imitate what Greg Nicotero created in the tv series. Doing something like what we see in the picture above is very elaborate but not impossible. You need materials like latex and silicone to create wounds and effects like the one above. And inside the zombie costume itself you can choose to alter some things. 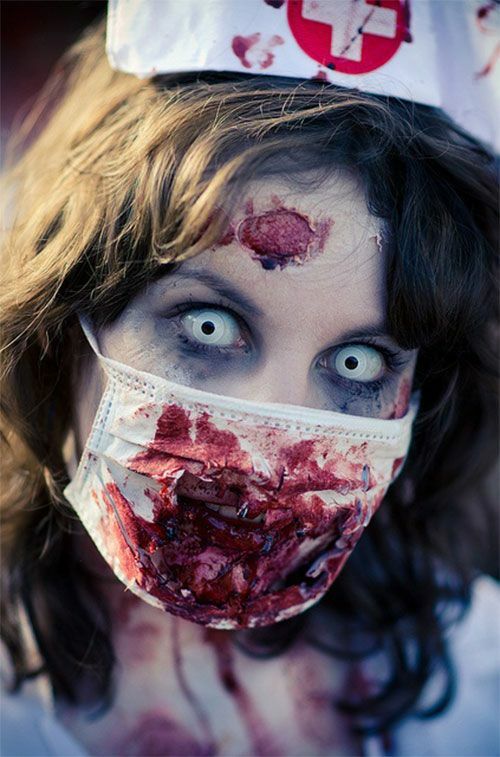 For instance, we can choose to combine a zombie and a nurse costume. Do your makeup like the one we have recommended thoughout the post and then put on a nurse costume, and also add a mask, full of blood. By looking the same as the girl in the picture above, you will be the most terrifying nurse this Halloween.